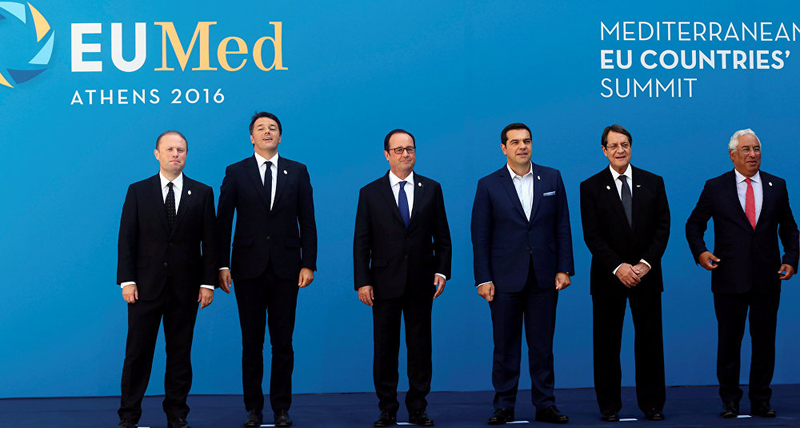 The EuroMed meeting was meant to improve the EU’s cohesion; instead it risks further dividing the bloc. Leaders from six EU countries, including Cyprus, France, Italy, Malta, Portugal, and Spain, met in Athens on September 9 at the invitation of Greek Prime Minister Alexis Tsipras. The meeting’s purpose was to boost cooperation and coordination among the so-called ‘EuroMed’ countries in order to press their vision for Europe in Brussels. In doing so, the EuroMed risk dividing the EU along a north-south axis, hindering the ‘cooperation and coordination’ of the organisation at large. This will heap further pressure on Brussels, which is already weakened by the ongoing financial and migrant crises, a rise in Eurosceptic populist parties, and the United Kingdom’s decision to leave the bloc. Tsipras had a domestic agenda for the meeting. Having been elected on a promise to combat rising poverty and unemployment by rejecting austerity, Tsipras reversed course mid-2015 and pledged to implement 15 new austerity measures to obtain a critical rescue package. Greece is due to receive the last payment from the rescue package this month but the lending ‘troika’ – the International Monetary Fund, the European Central Bank, and the European Commission – are holding out as Athens has only fulfilled two of the promised reforms. The EuroMed meeting provided Tsipras with an opportunity to assess how much flexibility from the bailout program he could gain for Greece as well as assurances on future debt relief. The other EuroMed members have budget woes of their own and they have spent years looking at the conditions in Greece with concern that it may resemble their future. They therefore have motivation to show solidarity with Athens in the weeks ahead. The troika are yet to apply similar pressure to other EuroMed countries as they have to Greece. This is partly because their budgetary situations have not been as dire and their politicians more ready to embrace the tough reforms required to address their deficits. Yet in August, both Portugal and Spain were granted waivers from ‘deficit fines’ for having annual deficits greater than three per cent of total economic output, contrary to EU rules. France received a similar waiver last year. This has been seen as a move to prevent further stimulating Eurosceptic populist movements, which are flourishing in the south. It also suggests that Greece may have some room to negotiate with its creditors. Friday’s meeting was intended to do more than provide Tsipras with political capital. The leaders released an ‘Athens Declaration’ at the conclusion of the mini-summit, calling for a “different version of Europe” that did not just rely on “rules, technicalities, and austerity.” The reference to austerity reflects growing calls from the south for a new approach to Europe’s ongoing financial crisis. For almost a decade, the EU has pushed an austerity program, driven mainly by Berlin – the chief financier of the bailouts. However, for many southern EU citizens, the economic outlook remains bleak, with all EuroMed counties experiencing projected growth at less than one per cent. 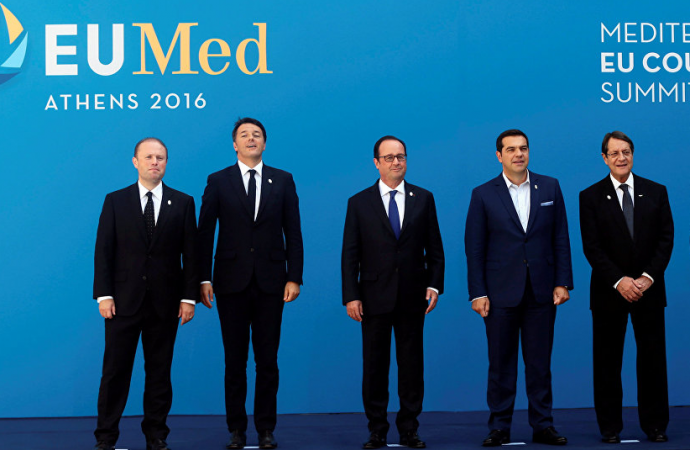 EuroMed leaders want a new economic strategy, one that concentrates on boosting spending, tackling unemployment, and improving investment. This plan has faced resistance from the more fiscally-conservative north because it would inevitably involve further cash injections. Yet with the impending departure of the UK – the bloc’s second-largest economy and the vanguard of austerity – the south may be in a position to push back; France, Italy, and Spain will become the EU’s second, third, and fourth largest economies, giving them significant clout in negotiations. Brexit has become the catalyst for change in the EU. EuroMed leaders want the Athens Declaration to “mark our common will to strengthen cohesion and unity of Europe” without constant obstructionism from London. However, they will be hard-pressed to convince their own populations that EU expansionism is beneficial, even if it involves a growth-oriented strategy. In Italy, the Eurosceptic Five Star Movement has been rising high in the polls, and Spain is on its way to a third vote to form a government as the populist Unidos Podemos alliance forms a major block to stable governance. 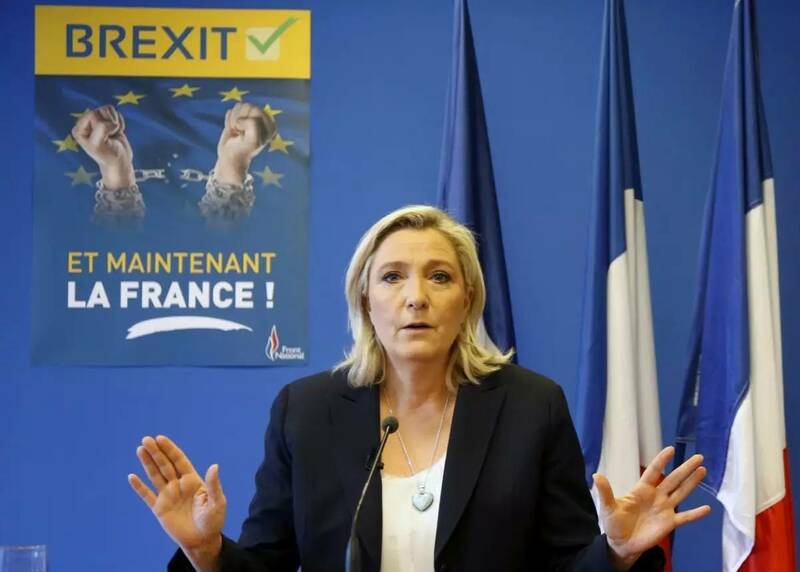 France may have to wrestle with the notion of National Front leader Marine Le Pen reaching the second round of upcoming presidential elections, and she has promised France will have its own referendum on leaving the EU. Even if the EuroMed are able to improve their cooperation and coordination and press their vision for Europe, they will have to overcome other schisms in the bloc. Northern Europe’s leaders may privately accept the idea of easing austerity to avoid inflaming populist movements in the south. But they are bedeviled by anti-establishment movements of their own; the far-right Alternative for Germany won 20.8 per cent of the vote in state elections on Sunday and the Eurosceptic Party for Freedom is leading polls in the Netherlands. This may cause northern politicians to harden their own stance on foreign and economic policies in order to protect their positions at home. Though the EuroMed claims they “do not wish to become yet another initiative that divides Europe”, the split between north and south over economic strategy is evident. But it is not the only crack splintering the EU. Fears over growing populist movements, unchecked migration, and members leaving the bloc were all high on Friday’s agenda. If the EU is to see its way through these crises, it will require a more unified response. The EuroMed initiative may mark the beginning of that transition – or it might be just another step on the road to the EU’s demise.